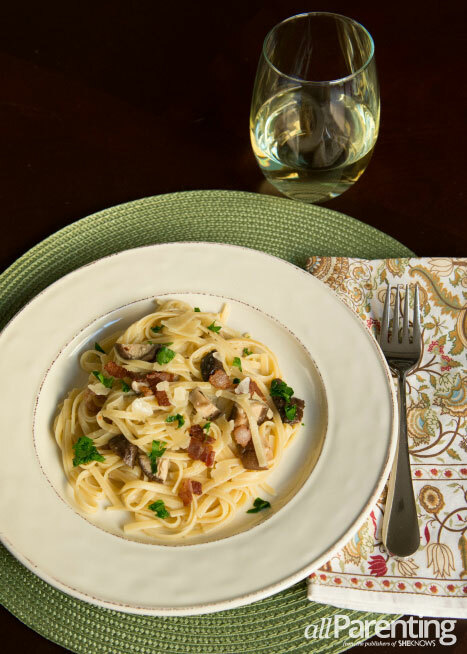 If you're stumped for what to make this Valentine's Day, we have you covered with this fantastically decadent pasta dish that's loaded with pancetta, truffle oil and gloriously roasted shiitake mushrooms. This is a meal you won't soon forget. Planning a Valentine's Day dinner can be tricky. You want something flavorful and unique, but nothing that's so difficult to prepare that you're trapped in the kitchen all night and not with your sweetheart. This easy-to-prepare recipe is infused with pancetta (who doesn't love what's essentially fancy bacon?) and has an extra layer of rich flavor from the truffle oil. This is a meal that neither of you will soon forget. In a large bowl, whisk together 1 tablespoon olive oil, 1 minced garlic clove and white wine. Add mushrooms to this mixture, toss to coat and spread evenly on a cookie sheet. In a large sauté pan over medium-high heat, cook pancetta until crispy. Transfer to a paper towel-lined plate and add the remaining 2 cloves of minced garlic to the pancetta drippings. Cook, stirring occasionally until the garlic is golden brown. Drain pasta, reserving 1/2 of the pasta water. Add the cooked, drained linguine, roasted mushrooms, pancetta and reserved pasta water to the garlic. Sprinkle with kosher salt and toss to combine. Top with a healthy drizzle of truffle oil, shaved Parmesan cheese, parsley and serve.